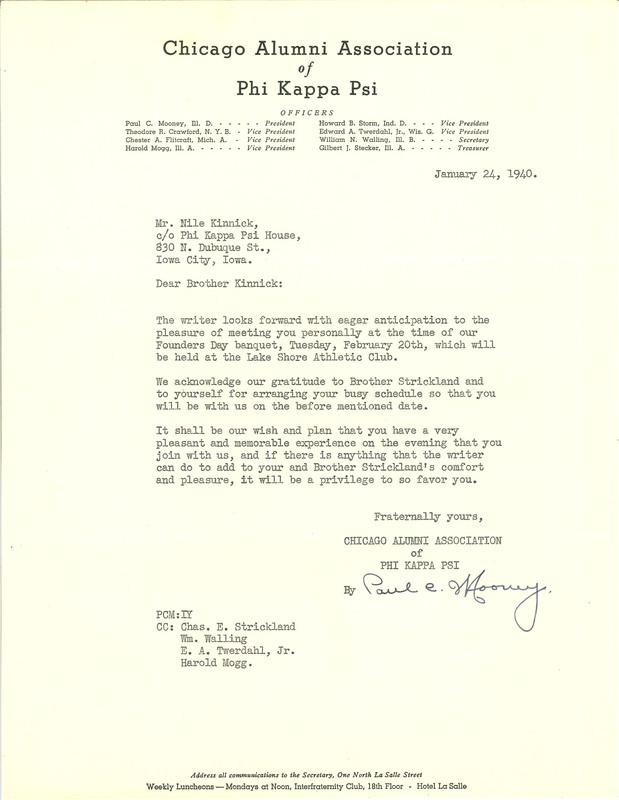 Chicago Alumni Association of Phi Kappa Psi January 24, 1940. Mr. Nile Kinnick, c/o Phi Kappa Psi House, 830 N. Dubuque St., Iowa City, Iowa. Dear Brother Kinnick: The writer looks forward with eager anticipation to the pleasure of meeting you personally at the time of our Founders Day banquet, Tuesday, February 20th, which will be held at the Lake Shore Athletic Club. We acknowledge our gratitude to Brother Strickland and to yourself for arranging your busy schedule so that you will be with us on the before mentioned date. It shall be our wish and plan that you have a very pleasant and memorable experience on the evening that you join with us, and if there is anything that the writer can do to add to your and Brother Strickland's comfort and pleasure, it will be a privilege to so favor you. Fraternally yours, CHICAGO ALUMNI ASSOCIATION of PHI KAPPA PSI By Paul C. Mooney PCM; IY CC: Chas. E. Strickland Wm. Walling E. A. Twerdahl, Jr. Harold Mogg.